Mutant is a series of Swedish role-playing games that were developed and published by Target Games. The current version is developed by Fria Ligan under license by Cabinet Entertainment and published in Swedish and English by Fria Ligan and Modiphius respectively. A video game adaptation named Mutant Year Zero: Road to Eden was released December 2018. The campaign setting was very similar to Gamma World, taking place hundreds of years after a big catastrophe. The world is populated by humans, robots, and mutants (including anthropomorphic animals). The rule system was similar to the modified Basic Role-Playing rules used in Target Games' earlier Drakar och Demoner game, utilizing a percentile die. In 1986 a rules expansion called Mutant 2 was published that among other things introduced a more advanced skill system, advanced rules for combat, hit locations and a more developed campaign setting. In 1989 Target Games introduced a new version of Mutant (unofficially branded "New Mutant" to distinguish it from the older version). In this version, it was the year 2089 and the world was ruled by large corporations in gigantic cities, like in Judge Dredd. 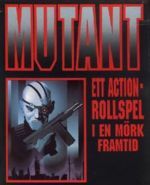 This was the first cyberpunk role-playing game in Swedish. The rules were simpler compared to the ones introduced in Mutant 2. Mutant RYMD ("Mutant SPACE") was the next, short-lived, version of Mutant published in 1992. The campaign setting was similar to the 1989 version but in Mutant RYMD the corporations put much effort into space exploration and colonization, eventually reaching a fictional tenth planet named Nero and awakening an evil, supernatural force that attacks the solar system. Some of the monsters and symbols were taken from another of Target Games' role-playing games, Kult. The rules were more or less identical to that of the 1989 version of Mutant. In 1993 Mutant RYMD was discontinued in favor of Mutant Chronicles, a game which inherited many aspects of RYMD's campaign setting. The 1993 version of Mutant Chronicles is not to be confused with other games called Mutant Chronicles published by Pressman Toy Corporation, now the intellectual property of Paradox Entertainment, although the games are based on the same property. After the reconstruction of Target Games and the transfer of its intellectual property to Paradox Entertainment, a new version of Mutant was published under license to a company called Järnringen in 2002. This version, Mutant - Undergångens arvtagare ("Mutant - Heirs of the Apocalypse"), returned to the original post-apocalyptic campaign setting but with a new set of rules. In 2014 a new game in the franchise was released by Fria Ligan, under license from Paradox Entertainment. Dubbed "Mutant - År Noll" the game uses the same setting as the original 1984 version and "Undergångens Arvtagare", but set several hundred years earlier. In "År Noll", and in future expansions, players can play through the emergence of the mutants, the mutated animals, the robots and finally the non-mutated humans into the ravaged world. "År Noll" uses a custom set of rules based on the physical and psychological hardships of surviving in a post-apocalyptic world. "År Noll" was translated into English and released as "Mutant - Year Zero" in December 2014. The first expansion to the Swedish version, "Genlab Alfa" was released in the spring of 2015. A German version of "År Noll" was released as "Mutant - Jahr Null" in 2018. In 2015, Cabinet Holdings acquired Paradox Entertainment Inc. and all subsidiaries and their properties, including Mutant.